Westport Ma Waterfront Homes for saleReal Estate,Beaches & More..
Homes in Westport MA are affordable generally starting in the $190,000's. A 3 bedroom ranch on 1/2 acre starts around $200,000. There are beautiful waterfront homes in Westport and Westport Point on the scenic Westport River starting in the $300,000's up to 5 million dollars. The school system in Westport MA is considered good. Westport boasts a low real estate tax rate & some of the best beaches in the state. To make your home in Westport Ma visit Free list of Homes for sale including foreclosures houses and short sale bargain homes. 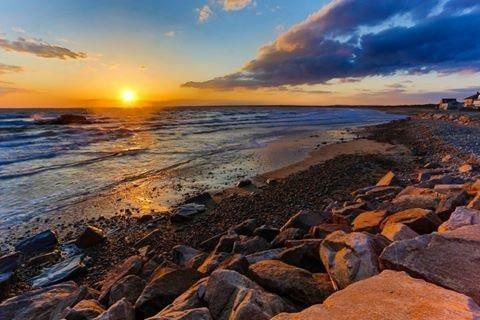 Westport MA is Home to a variety of gorgeous public & town beaches. For town beaches, Westport Beach Stickers are NO LONGER available at the Westport Town Hall in the town clerk's office. Email me Karenmartin1@remax.net for the 2016 Westport town beach pass application & instructions. That you mail in with fee. You must have proof of residency ( vehicle registration or tax bill) The beach sticker fee is $30. for the year, or $15. if you are age 65 & older. A current & valid vehicle registration is required from year round residents of the town. A current & valid registration and recent paid Westport Real Estate Tax bill are required for all non- resident property owners. Public Beach: Horseneck Beach State Reservation Considered one of the best beaches in New England. Take Rte 195 to exit 10 Route 88 South Westport Ma on the west end of Buzzard's Bay. This sandy 2 mile long beach is excellent for wind surfing, swimming and wave jumping. Concession stands & bathrooms available . Lifeguards on duty. This beach gets crowded on hot days. Fees- $8 per car load, seasonal passes available. See above for Free beach pass. Gooseberry Island Westport MA- No fee but limited parking and jams up early morning so you need to get there early. Nice beach & ramp. You can sail out to the islands or over to other nearby beaches. One side is calm nice for swimming the other side very rough. You can take a walk around the island and there are nice views of St. Elizabeth Islands on a clear day & beautiful sunsets. No lifeguard. From Rte 195 take exit 10 , South on rte 88 Westport, go to end of rte 88 take a right, go to end over causeway. Westport Town Beach also called Cherry & Webb Beach Westport MA If you like Horseneck Beach you will love the Westport Town Beach. Town Beach sticker required. An absolutely beautiful beach. Great beach for a walk or run. With plenty of room to roam a nice place for the kids to fly kites or bogey board. Life guard on duty Memorial Day to Labor Day. Nice for swimming but This beach can get rough. Also good for collecting sea shells. south on rte 88 in Westport, go over Fontaine bridge, take first right go past Back Eddy Restaurant bear left & go straight to end, parking lot is on the left , small walk over dunes to beach. Very picturesque. Westport Childrens Beach ( Located on the Westport River) I call this beach the Baby beach, Near the yacht club. On the Westport river and is very calm. Good for swimming & wading and safer if you have small children. Parking lot sticker required. No lifeguard Go over the Fontaine bridge on rte. 88 take your 1st right go straight to end of Road parking lot is on the right. East Beach Westport Mass. -sticker required. This beach is rocky & has nice views of the Elizabeth islands and gorgeous sunsets. The surf can be rough, no lifeguard on duty. Park here in the evening for breath-taking sunsets. In winter, seals can be seen swimming. Traveling south on rte 88, Go to the very end. Take a left. Not good for walking but if you park at the end there is a nice walking trail to the east that is MA Audubon land and takes you through a nice wildlife sanctuary on Allen's Pond in Dartmouth. In winter seals can be seen frolicking around the rocks . Westport River Head of Westport-Westport Massachusetts located at the Head of the East Branch of the Westport River. The Westport River is known for its picturesque rural landscape, easy paddling, and great birding (we have New England's largest concentration of breeding ospreys). Located within minutes of pristine salt marshes, protected bays and harbors, and the open waters and waves of Buzzards Bay and The Elizabeth Islands. Kayaks are available for renting or bring your own. Also a nice picnicing spot. From Rte 195 take exit 10 Rte 88 at second set of lights ( Old County Rd) take a left, go past the Westport Middle School - The Head of Westport & Westport River is on your right. Forge Pond Westport has acquired land around Forge Pond ( off Forge Rd near the dam) which is open for fishing & has hiking trails. There are many other ponds in Westport, including Sawdy Pond, Watuppa Pond, Devol Pond that boast excellent bass fishing. My new favorite in Westport Grum's Restaurant on Charlotte White Rd. Very good seafood & very reasonably priced. Serves Breakfast Lunch & Dinner. The Bayside close to East Beach is the best dinky little restaurant in MA (self proclaimed ) know for seafood platters, fried clams and is a certified "Green Restaurant"
The Back Eddy set on the Westport River has a just over the Fontaine Bridge has an array of local fresh seafood & produce a bit on the expensive side. Visit Westport Rivers Vineyard & Winery for a fun and educational exploration of the world of wine. Yankee Magazine has honored Westport Rivers as one of the best touring destinations in New England. Westport Rivers is a family owned vineyard and winery producing estate grown wines from New England 's largest vineyard. Wines include traditional method sparkling wine, Chardonnay, Rosé of Pinot Noir, Riesling and other Alsatian varietals. Best known for sparkling wines which rival any from around the globe. Open 7 days a week, year round. Tues - Sat 11am-5pm and Sun - Mon 1pm-5pm Hay rides are offered in the fall showcasing the beaty of the Westport River.